In the summer I had the pleasure of attending Bestival, on the Isle of Wight. 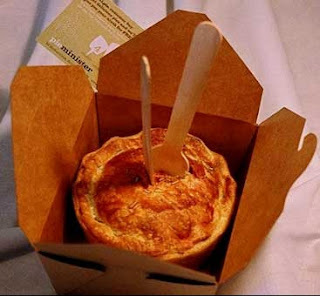 I heard great things about a food stall named Pieminister - though I was never actually able to dine on their pies. From what I understood, Pieminister was rather legendary on the festival circuit and had built up a phenomenal reputation in the pie-consuming community. A couple of days ago I was perusing the pie aisle of Sainsbury's, and spotted a Pieminister pie! Naturally I had to make a purchase, and the pie was incredible. So yes, Pieminister pies are now on sale in Sainsbury's! 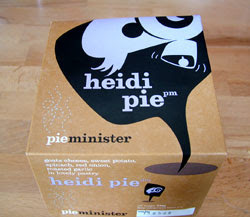 While I had the Henny Penny chicken and mushroom pie, this Heidi pie was the Champion of the vegetarian section in the 2009 British Pie Awards and Pieminister's Chicken of Aragon pie also won a gold medal in the savoury hot category. Would you believe it but in our infant days we forgot to rate these pies! However don't worry, we have plenty of pies rated and ranked on our Pierate Pie Rankings or find other pies of a similar flavour to these. You can also click here to compare and read about all the Pieminister pies we have now rated! Snooker Championships get Pukka deal!